This Shabby Chic pumpkin is jam packed full of techniques and just in time for Fall! Trick your machine into doing all the work for you. Let your embroidery create the chenille right inside the hoop! Double the fun by making two pumpkins flat and bringing them to life by stacking them for a 3D effect surely to dress up your Fall decor. Then tie it all together with a pretty little bow made right inside the hoop (with a bit of hand stitching). All this is headed your way so you can be ready for those falling leaves. 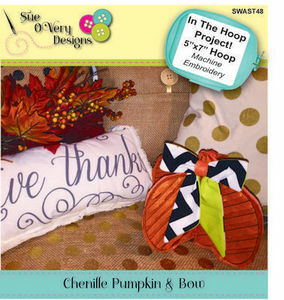 Learn these techniques: Chenille right inside the hoop, 3D standing pumpkin shape, Create a bow as decoration for the pumpkin. Final dimensions: 7in wide x 5in tall.